My friends it has been a crazy week. Monday, my mother had a surgery that was more involved than anticipated. Yesterday, my husband showed up in the drive way covered in vomit. Both toddlers have been in rare form and the baby is entering a don’t put me down or I will scream my head off stage. To say this week has been trying is one heck of an understatement. BUT – I know during these difficult times it can be especially helpful to slow down and remember the many things that we are grateful to have in our lives. I’m great at helping our family be grateful during the holidays – it helps that one is explicitly called Thanksgiving! We make a gratitude tree every year. We put up a simple cardboard or paper tree. 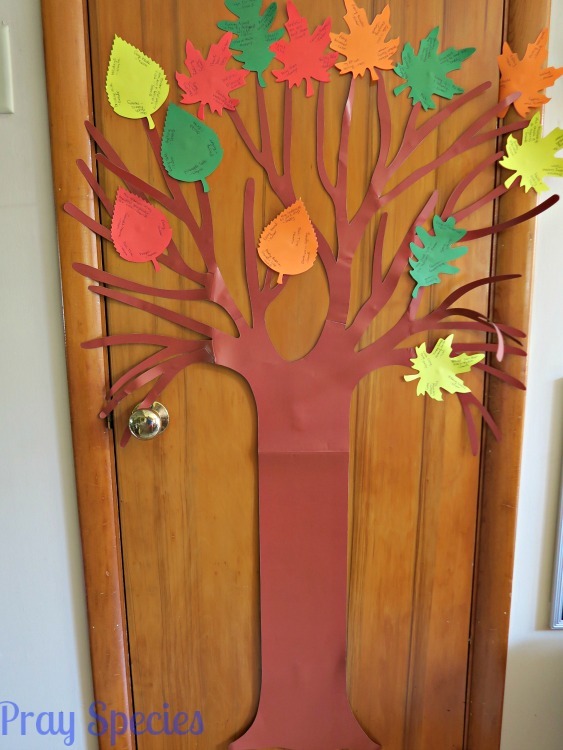 At dinner time every night during the month of November we add a leaf to the tree with one thing everyone is grateful for that day. This year Thanksgiving fell just days after we brought our youngest home from the hospital. I saved the leaf from the day we got home from the hospital for his baby book. 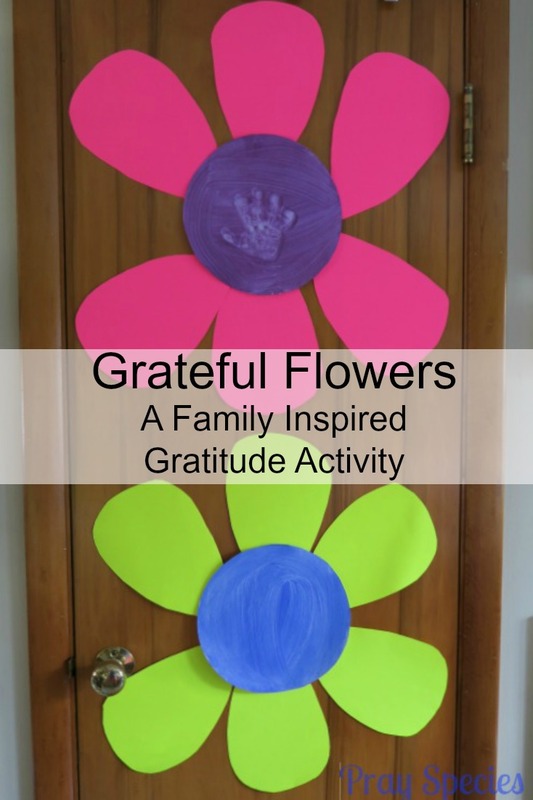 OK – honestly, I just took it down off the door today in order to put up these new gratitude flowers – but, hey I totally put it in his special box to go into his baby book, someday. The grateful flowers are simple to make. I’d love to give you more complete instructions with detailed measurements and a printable template, but life is VERY real over here today. 1. 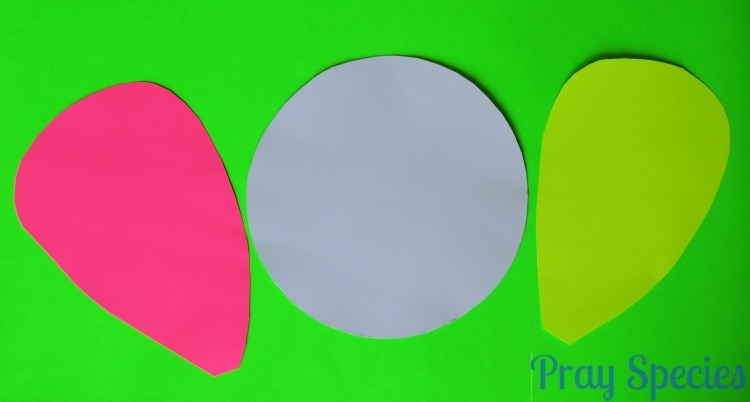 Make a circle for the center of the flower. Yes! Swimsuits in April – I LOVE the south 🙂 Ladybug is mixing red and blue to make purple and Owl is using blue. I used white cardboard. I traced a mixing bowl to get my circle and then cut it out with scissors. I had the kids paint the circle, so they could feel involved, but not so involved that I thought my head would explode. I (OK, Gram) hand sketched a petal on some paper. I used this guideline as a template to cut out six petals from two additional sheets of cardboard (12 petals total). Our petal colors were fluorescent pink and fluorescent yellow, because folks that’s what we had available today. I LOVE that Ladybug decided to put a hand print in the middle of hers! It’s just right! Once the paint on the flower centers dried, I assembled the flowers using sticky tack and put them up on the closet door near our dining room. Each day at dinner during Spring we will add something for which we are grateful to the petals. I can’t wait to hear what my kids come up with; the big things and the little things. In this CRAZY week in this CRAZY life I’m so glad that something as simple as a gratitude flower can remind us to slow down and remember the many things we are grateful to have in our lives. If you’re looking for a preschool flower activity to enhance your little one’s math skills be sure to check out Raising Little Super Heroes – Count and Clip Sunflowers! 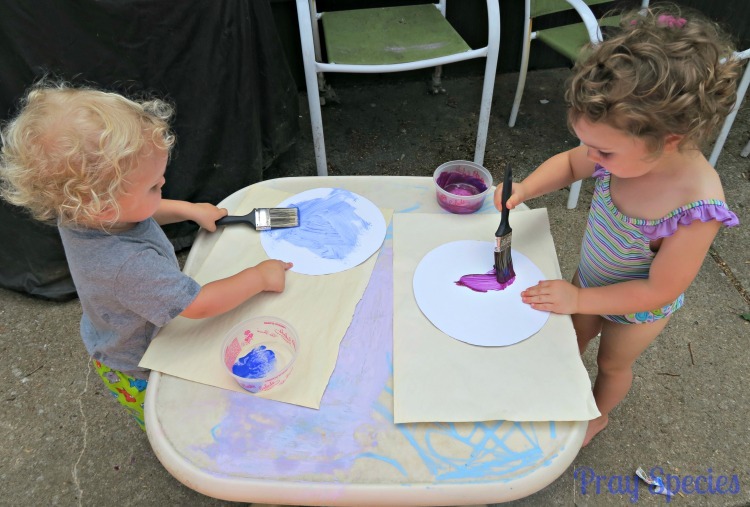 Given how exciting life with little ones can be, lots of our fun activities don’t make it on the blog these days. Be sure to catch up with us on Facebook and Instagram. We love making new online friends and sharing ideas!